Housed in the Brick Breeden Fieldhouse are the Department of Athletics’ offices, the Bill Ogle Hall of Fame Room, team locker rooms, the Academic Success Center, the D’Agostino Strength Training Center, the Athletic Training Center and the All-American Cafe. The Brick Breeden Fieldhouse also plays host to concerts, including the likes of Tom Petty and the Heartbreakers, Crosby, Stills and Nash, Toby Keith, Clint Black, Wynonna Judd, James Taylor, Bob Dylan, Matchbox 20, BB King and Snoop Dogg. In addition, numerous trade shows and rodeos are held under the giant wooden structure. 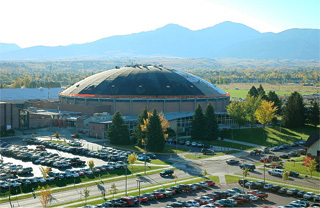 In 1956, Montana State University’s Brick Breeden Fieldhouse/Worthington Arena opened as the premiere college basketball and all-purpose facility in the Northwest. The MSU Fieldhouse, as it was then known, was the largest domed structure in the western hemisphere without a center support. Completed in 1958, this building was named after Brick Breeden, who became head basketball coach and athletic director, and Max Worthington, avid Bobcat booster for over six decades. The Worthington Arena seats 10,000 fans.